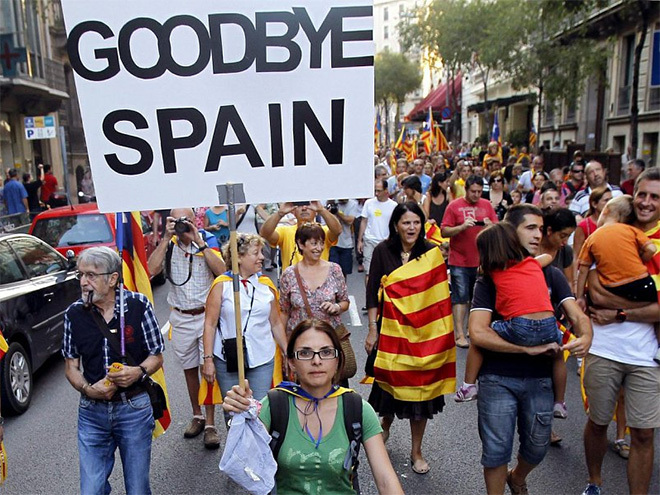 A new poll from the Spanish newspaper El Periódico shows that a clear majority of Catalans support independence from Spain, and an even greater number demand that the Spanish government recognises the right of Catalonia to decide its own future. 57.8% of those polled said they would vote in favour of Catalonia becoming an independent state, 36% were against and 6.2% didn’t know or had no opinion, when don’t knows are removed, this would give a referendum result of 61.6% Yes, 38.4% No. The Spanish government of Mariano Rajoy claims that the Catalan independence referendum runs against the Spanish constitution and is illegal. Veiled, and not so veiled, threats have been made by senior members of the ruling Partido Popular to send in the armed forces or the paramilitary police force the Guardia Civil if the Catalans do not back down. However the new poll shows that Madrid’s hard line position has had little success in persuading Catalonia to reconsider, and Catalans remain unimpressed by Madrid’s threats.